A short post today on how the debate about bringing your own device to school is superfluous and antiquated. After all, they already do. Case in point: when a student wants to borrow a pencil, I have them leave collateral in the front of the room. I accept shoes, keys, wallets, and of course, cell phones. Cell phones are the collateral of choice. The collateral pile yesterday during district testing. Now, when you think about the kids who are always handing over the phones, these are typically not the most responsible or prepared of students. After all, when asked to get out something to write with in Language Arts, some seem genuinely surprised at the request. These are the generally the kids who say they don’t have a computer at home. These are generally the kids who allow schools to make excuses about not using technology in the classroom because teachers and admin worry about keeping equipment safe and intact. Yet, these same students are always packing their phones, and unlike their backbacks, when they hand over the phone, I know that they will never walk out of the room without it. So let’s stop the debate and start using the real life resources around us. We want students to have some ownership in their learning? Have them provide some of the means in which they learn. If our job is to help bridge the gap between school life and real life, let’s stop blocking students from using that which they already own, use, and respect. Oh, yeah. Going back to my collateral pile. 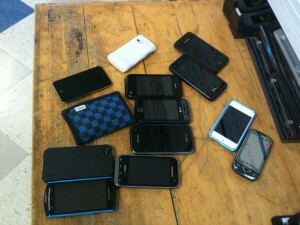 And if one of the phones from the pile buzzes while class is in session, I give you permission to answer it. I’ve also been known to text someone back.